Texas Instruments has expanded its TI-Nspire line of interactive classroom tools. 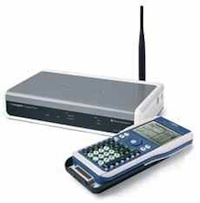 At the FETC 2010 conference in Florida, the company introduced TI-Nspire Navigator, a wireless student response system especially designed for math and science educators to facilitate and measure classroom instruction and collaboration. With the TI-Nspire Navigator system, teachers can gauge, in real time, student comprehension of lessons. TI said students can also use it to become more participatory in their own learning, build critical thinking skills, and explore cause-and-effect relationships in mathematics through real-time manipulation. The system includes a central hub and handheld "sleds" that attach to the backs of graphic calculators, adding wireless communications capabilities to the devices. The central hub communicates with the instructor's computer, allowing the teacher to see activity on the students' devices. The sleds are rechargeable, and the system includes cradles in which the sleds rest between uses. TI said it piloted the new system with about 3,000 students and more than 20 teachers in a variety of math classes. "The TI-Nspire Navigator system lets students compare work and explore incorrect answers in a non-threatening environment," said Donald Worcester, mathematics instructor and curriculum leader at Winter Park High School in Winter Park, FL, one of the teachers who participated in the pilot. "In five minutes, I can get an assessment of where my kids are and adjust my lesson accordingly. I can make sure none of my students gets left behind day-by-day and over time." The TI-Nspire Navigator system is available now through instructional dealers.